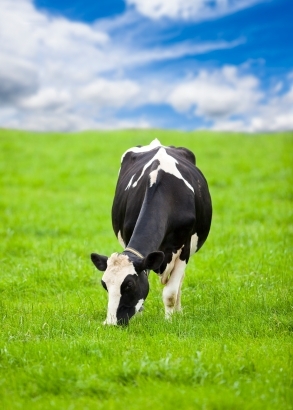 New organic standards insure greater access to pasture for grazing. Presented with two equal-priced apples or cheeses – one organic and the other produced with conventional methods – which would you choose? Does upping the price of the organic product by 10-40 percent change your mind? Will knowing that substituting organic for conventional fruits and vegetables drastically reduces the body’s burden of pesticides alter your choice? Such decisions have become routine for even mainstream shoppers who’ve never set foot in a specialty health food store, now that Wal-Mart and major supermarket chains are competing with their own organic product lines and corporate giants, such as General Mills and Kraft, have jumped into the organic market under different brand names like Cascadian Farms and Boca. What consumers believe about the differences between organic and conventional foods, and the value they place on those differences, will obviously drive their choices. However, most people probably have only a rough idea of what an organic label signifies and even sketchier knowledge of how conventional foods are produced, leaving them ill-equipped to make an informed choice. The U.S. Department of Agriculture (USDA) sets national standards for the production and handling of agricultural products earning the USDA Organic Seal. Only when all ingredients are organically produced can an item be labeled “100 percent organic.” Foods made with at least 95 percent organic ingredients may only claim to be “organic,” whereas those with at minimum 70 percent organic ingredients are restricted to labeling as “contains organic ingredients” and are also denied the USDA Organic Seal. Organic produce relies on traditional farming methods established prior to the 20th century, like crop rotation and use of composted animal manure, to maintain biodiversity and soil fertility. Genetic modification, where genes from another species are inserted into DNA, is not allowed, and crops must be grown without conventional pesticides and fertilizers made from synthetic ingredients for at least three years. Application of sewage sludge to farmland is prohibited as is ionizing irradiation to kill pathogens. Both organic farms and food processors must pass yearly on-site inspections by accredited certifiers. However, organic does not imply that food is produced locally, a common misconception – e.g., agribusiness giants like Dean Foods, General Mills and even Whole Foods import organic ingredients from as far away as China. Organic meat, poultry, eggs and dairy products derive from animals not treated with the growth hormones and antibiotics commonly given to animals raised in conventional agriculture. In animals used for dairy products, all feed must be purely organic for the previous year, whereas lifetime organic feeding is mandated when animals are raised for meat. Specifically prohibited feed additives include plastic pellets for roughage and the inexpensive protein boosters urea and chicken manure, all permitted in conventionally-raised livestock. Feeding newborn calves with a milk replacer containing cow blood is also an organic no-no although still commonplace in conventional dairy operations. This practice was banned in Britain and Europe for fear of infecting cows with ‘mad cow disease. Starting June 17, 2010, for meat, milk or cheese to be certified organic, stricter rules go into effect to insure that ruminant livestock both have year-round access to the outdoors (confinement indoors is barred) and graze on pasture during the grazing season. The previous, loosely stated rule that livestock have “access to pasture” is being replaced by an explicit minimum requirement for grazing a third of the year during which sustenance must derive at least 30 percent from grazing. Also, the farmer is required to demonstrate a plan for managing the pasture as organic cropland. Compliance with the new rules will be verified by yearly record reviews and on-site inspections. Beyond recently mandated “country of origin” labeling and identification of raw, unprocessed foods that have been irradiated, conventional food labels reveal next to nothing about how an item was produced, leaving consumers shopping on blind faith. There is no requirement to list the kind or amount of pesticides, hormones or antibiotics that were introduced, even though residues may taint the final product. Labeling gaps also keep Americans largely unaware that consumption of genetically modified foods is now practically unavoidable, given that 85 percent of corn and 91 percent of soy grown in the United States is genetically modified, according to the latest USDA figures. And, consumers will certainly not find labels identifying products from animals reared in factory farms notorious for practices considered by many to be inhumane, like isolating breeding sows or veal calves to containment crates so tiny they can’t turn around or de-beaking hens that otherwise would resort to cannibalism because of the stress of intense crowding. The issue of whether organic foods are any more nutritious than conventional foods has been hotly debated. However, based on a survey of research on crops and livestock spanning the last 50 years, an analysis published in 2009 in the American Journal of Clinical Nutrition concluded that organic foods are not nutritionally superior. Nevertheless, at least for pesticides, it’s hard to argue that they’re good for humans because they are, after all, meant to kill living things. Numerous studies have in fact linked neurodevelopmental disorders, especially in children of farm workers, to pesticide exposure. Research from Harvard University made public in May 2010 indicated that even children in the general population exhibiting higher urinary levels of malathion pesticide residues – in whom diet would be the more likely route of exposure – might be at greater risk of developing attention deficit hyperactivity disorder. That eating organic foods significantly reduces the body’s pesticide load has been demonstrated in previous studies, like one published in Environmental Health Perspectives in 2008 which found that replacing conventional fruits and vegetables with organic counterparts in the diets of children rapidly eliminated nearly all signs in their urine of exposure to common pesticides. To empower consumers to make more informed choices about produce, the non-profit organization Environmental Working Group (EWG) recently published a down-loadable “Shoppers Guide to Pesticides” which ranks conventional produce according to pesticide residue levels. Celery, peaches and strawberries led the pack of the “Dirty Dozen” testing highest for pesticides, whereas onions, avocados and sweet corn topped the least contaminated “Clean 15” list. EWG also concluded that eating five fruits & vegetables per day from the Dirty Dozen list would, on average, expose a person to 10 pesticides daily, whereas this figure would drop to less than two if only produce on the Clean 15 list were consumed. The results of 96,000 tests performed through a USDA program went into developing EWG’s guide. Renowned medical expert Dr. Andrew Weil endorses choosing organic produce when possible and avoiding EWG’s Dirty Dozen when organic options are unavailable or too expensive for your budget. This entry was posted on Thursday, May 27th, 2010 at 7:16 am and is filed under diet, green business, health, science, sustainable living, toxics. You can follow any responses to this entry through the RSS 2.0 feed. You can leave a response, or trackback from your own site. 4 Responses to Is Eating Organic Worth It? I had no idea that feeding newborn calves with a milk replacer containing blood was still commonplace. I naively thought that had been outlawed — or at least was a rare practice — because of mad cow disease. Your article in Fullerton Observer of January, 2011, was the kind of thing suspected of water bottles for a long time. But I haven’t been able to find any actual experiments or links showing the statistics that the PET was at a dangerous level in the water in the bottles. don’t hold up under scientific scrutiny. Maybe if you could offer links to your findings from which you used for the article it could be a great help. All three of the college girls who live in my house carry those bottles around with them everywhere they go! They are quite convinced once good data is shown. Thanks so much for any help you may choose to offer. Please include this message in your reply. Sam – this is where the manufacturerers have the scientists (and public) over a barrel. We know PET bottles can leach phthalates and antimony. How would you design experiments that show there are safe levels of these toxins in humans? Acute exposure one day says nothing about what the effects might be from exposure over decades from drinking from PET bottles evry day. What about the additional exposure that occurs from other plastics products and cosmetics? And even if long-term exposure in lab animals shows deleterious effects, industry will always argue that the animal experiments don’t apply to humans (which is generally a very faulty argument but one that appeals to an uninformed public). For your family, I would emphasize that PET bottles ARE leaching antimony and phthalates and hope that the logic of avoiding constant exposure to unnecessary toxins does the rest.